I woke up this morning filled with the enthusiasm and anticipation that comes with having the opportunity to attend a yoga workshop, and I couldn’t wait to begin! The workshop was held at Bird Studios on New England Road in Brighton, beginning with two morning sessions of Mysore self practice, followed by an afternoon session with talks and demos by Hamish. While the studio space was compact, it never felt cramped, and every yogi present filled it with positive energy and warmth without encroaching upon your space or concentration. During the Mysore self practice, Hamish noiselessly moved around the room with astonishing speed; he was always there when you seemed to need a hand or adjustment, which were gentle yet strong, and elicited a level of trust that you could only imagine developing with a teacher you’ve learned from more than once. And I had never even met Hamish before! After a wonderful, utterly rejuvenating morning session followed by a 2-3 hour break (depending on when you started), Hamish began the afternoon session talking about the philosophy of yoga, Guruji’s teachings, the Yoga Upanishads, injuries, and modern life and yoga, all with an easy smile and endearing humour – a beautiful start to the session. 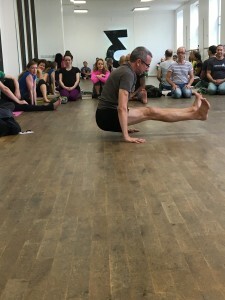 Students were encouraged to ask questions throughout, and he took the time and effort to fully understand and respond at length to each query, whether abstract or specific, related to the philosophy of yoga or the physical practice – all with the same humility and grace he exuded all day. In the second part of the afternoon session were some demonstrations of asanas and transitions, again delivered by Hamish with the same patience and gentleness he displayed all day. More questions followed each demonstration and each was addressed comprehensively – It’s a testament to how much he put us all at ease that no question felt too small, specific or irrelevant. The two hours of this session passed in a flash and I was very sorry to reach the end of it. Hamish’s workshop was truly a wonderful, memorable experience and I enjoyed every minute of it! Previous PostAre we paying attention?